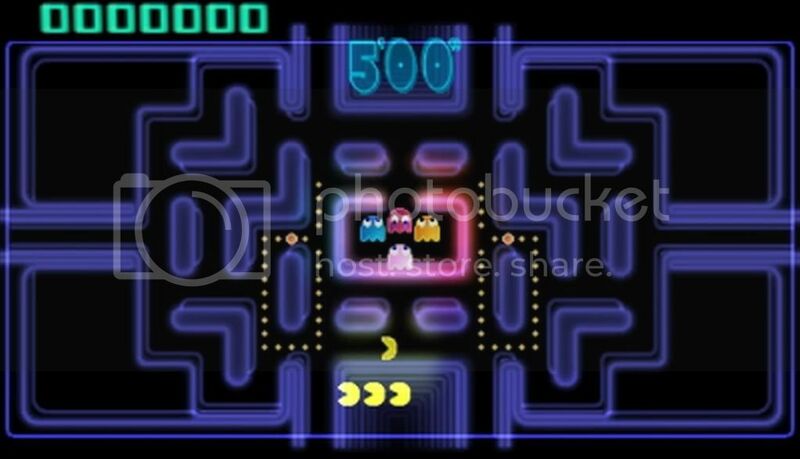 Pac-Man and Galaga are arcade classics synonymous with the words 'video games,' and rightly so: these two titles helped cement Namco's place in gaming history, most notably Pac-Man's iconic status and the countless versions and spin-offs that followed. First, you have the original arcade versions of Pac-Man and Galaga. The first thing you'll notice is the clever use of 3D. The most obvious 3D use is when choosing the arcade cabinet view, giving the effect of a convex glass television, recessed under the arcade cabinet's face. You can also choose table top cabinet (ie 'cocktail') or a straight, full screen version. Even the standard, non-arcade-cabinet view has the added benefit of displaying different objects at different levels of the 3D field. It's all very clean and gives you a bit of a fresh take on games you've probably played a bajillion times already! Pac-Man Championship Edition: You may have played this already on a different platform, but this is the first time CE has appeared on a Nintendo platform, and hence my first experience with the game. In case you aren't familiar with the CE edition, its gameplay takes the 1980 Pac-Man 2-D maze mechanic and embellishes the dot-munching gameplay by giving you a maze with a never-ending feast of delicious dots. You play until the time is up or you run out of lives, all while racking up the highest score possible. Munching all the dots in one section of the maze leads to a changing of the maze (including wall layout positions), with dots, fruits, and power pellets appearing somewhere else in the maze. To boost your score you can string together a chain of ghost munchies by using one power pellet after another. There are a total of 6 distinct maze layouts. The 3D effects are small touches that make the game seem livelier than it would have otherwise. For example, when you munch dots, the text for your points pop up and seem to float up into the air above the screen as they fade away. The large text for points earned munching ghosts also pops off the screen in a bold and flashy way. When you eat fruit, which causes dots to materialize and float over to the other side of the maze, the dots seem to fly over your screen, and you can see them settle into place. There's also the pulsating line border which also has nice 3D depth to it as it goes in and out of the screen. The environments, which include the barriers and walls that form the maze you navigate, are in 3D and have depth against the black background. Pac-Man CE is easily my favorite of the six games. This is truly classic Pac-Man taken to a whole new (high-score attacking) level. The music drives you; the constantly evolving levels, and the speed, all kick in just perfectly, resulting in a truly exhilarating experience. The game is easy to get into and very addicting. Note: This game is the original Pac-Man CE, and not the updated 2010 Pac-Man Championship DX. 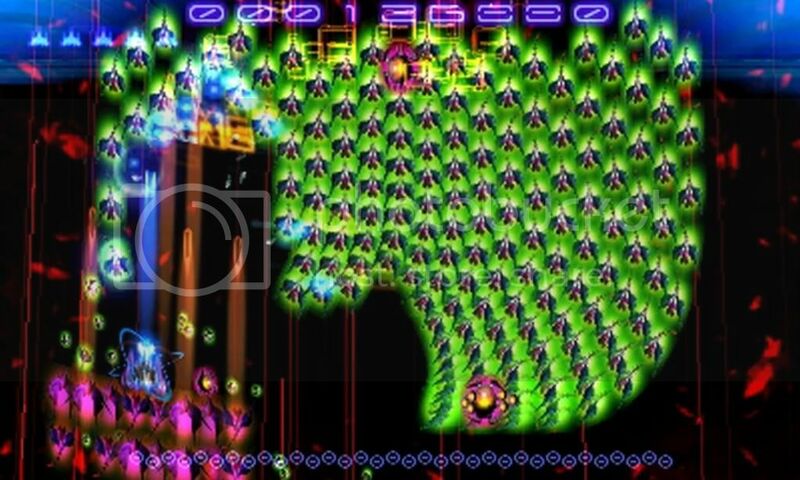 Galaga Legions is an action-heavy shooter that initially appeared on Xbox Live Arcade (2008). Unlike the original Galaga, you can now freely move your ship to any spot on the screen, though it can only shoot in the upwards direction. To compensate, you're given two 'satellite' ships that you must strategically set in the appropriate locations, in any of the four cardinal directions, or you can simply attach them to your ship for extra firepower. Switching the positions is very easy to do, but the overall challenge is very high. Don't be surprised to get Game Over many times; with each subsequent playthrough of the main Adventure Mode, the player is expected to make it just a little bit further than before. And you can always choose any single level for a quick playthrough. This game is definitely less about 'bullet hell' and more about 'enemy hell' (is that even a shooter sub-genre?? 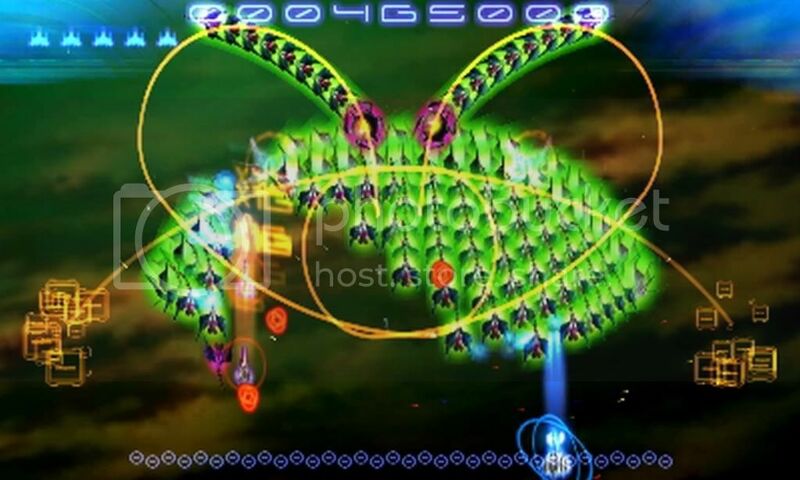 ), as swarms and swarms of enemies fill the screen in unexpected formations by the hundreds, devastatingly overwhelming your navigating abilities. At times you'll simply be chipping off chunks of the swarm at a time, carefully maneuvering to avoid crashing with the enemies surrounding you. The 3D effects in this game are some of my favorite eye candy in this collection: there's a lot of fine line colors swirling about while you're shooting down the swarms of enemy ships, including not just particles in the background, but the tell-tale lines in the foreground that strategically give you a brief 'heads-up' exactly where you should expect a swarm of enemies to appear within the next second or so. The fast techno music has good bass and sounds great. Pac-Man Tilt is one of the two new games included in this collection. This is a pretty basic 2-D action platformer which uses the motion sensor to 'tilt' the world while you move Pac-Man along (because of this, the 3D is automatically turned off). The tilt control is not as intuitive as it may seem because the game limits the angle at which you can tilt the screen. The experience overall is a bit bland, with very basic jump platforming and several hard-to-reach spots spread throughout each level as you try to collect all the items for the coveted 100%. There are a few fun sections where you get Pac-Man rolling along through tunnels (think Sonic the Hedgehog). But the combination of requiring you to move Pac-Man with the circle pad and carefully timing your jumps while also shifting his momentum using tilt motion is not intuitive and ends up being more frustrating than it should, resulting in repeated falling-to-your-death situations that are difficult to avoid. You'll occasionally run into the classic ghost enemies, and the only way to defeat them is to activate your stored power pellet (that you collect as you play each level) on the touch screen to enable temporary invincibility. And the music is utterly and terribly repetitive... completely forgettable! You will not want to play this one with the volume turned up at all. In addition, the use of colors and objects as 'eye candy' in backgrounds and level design are often extremely garish and are heavily distracting. None of it makes any sense; everything is so random. 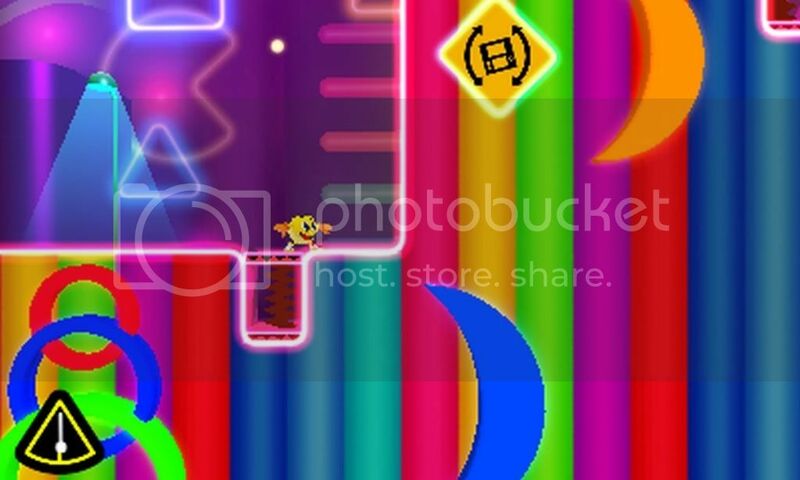 For example, in one level, there are large bowling pins and bell shapes in the foreground and background, flashing different neon colors against a purple and green diamond-pattern landmass, in addition to floating dice silhouettes in the background. Plain and simple, it's an ugly design. 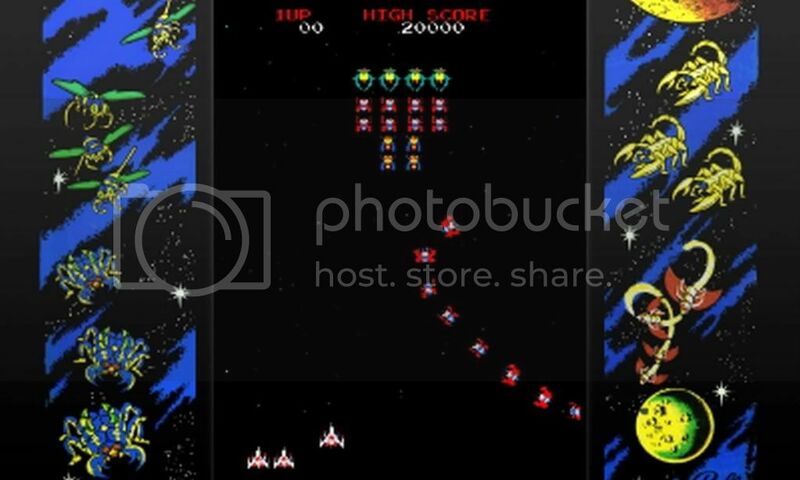 Galaga 3D Impact is the other new game included in the collection. 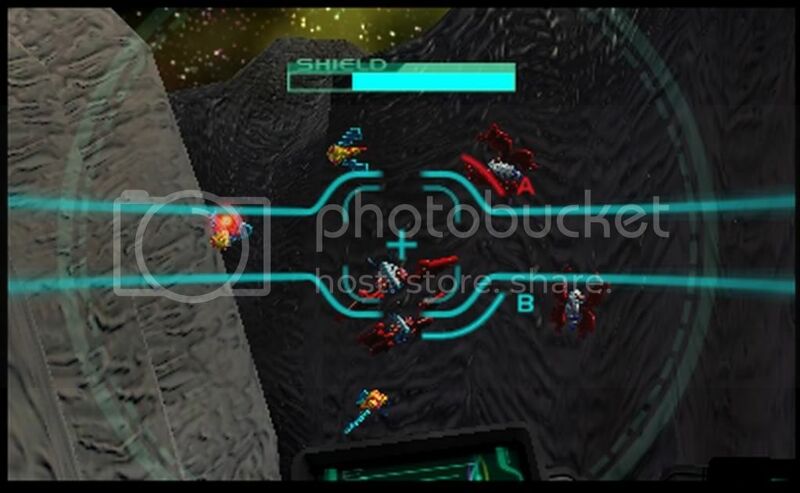 It's an on-rails shooter you can play using the gyroscope (a la Face Raiders), a simple but fun high score attack game. With 5 stages, it doesn't take too long to blast your way through, but the last few stages can be fairly challenging if you haven't made use of the upgrade system. You can't simply blast your way through the levels on the offensive. Rather, you must make full use (or 'abuse' may be the better term) of your ability to capture certain enemies with a special beam; capturing enough of a particular kind of enemy results in one of several upgrades, such as a boost in weaponry or shields, or new abilities like homing missile lock-on or time freeze. Upgrading helps ensure you've maxed out your stats resulting in you becoming one fierce little star fighter! I feel the upgrade system does add a bit of depth to the gameplay and is not simply an 'RPG element' tacked on in an effort to artificially extend gameplay. The 3D effects in this game are decent, but perhaps due to the constant shifting of the screen as you physically turn the 3DS quickly enough to keep up with the on-screen action, the 3D effect wanes a bit. As a total package, replay value is very good. There are online leaderboards for all six games, though only certain aspects of each game qualify for the leaderboards. You only have one high score for each game, so, for example, only one of the CE maps will have a ranked score (not the other 5 levels). Each game has a number of leaderboard lists: In the 'Overall' category, you can see where you rank among everyone else under 'personal' view, see the best scores in 'top' view, and compare yourself to friends in the 'friends' view. The same three views are also available in the 'Weekly' category, limits scores posted in the last week. This game also features a built-in 'trophy' system in the form of medals you can earn by accomplishing great feats, many of which my pathetic gaming skills have prevented me from even coming close to. Only Pac-Man Tilt and Galaga 3D Impact do not feature a medal system, while the other four games have a total of 16 medals for you to collect (I have no idea if these actually unlock anything though). To sum it up: Other than the weak Pac-Man Tilt, I'm fairly pleased with this collection, as most of the games offer quite a number of solid gameplay hours perfecting your skills and going for high scores that you can easily share and compare online. The new game entries don't add a whole lot to the package other than being nice bonus games to play in between the excellent Pac-Man CE and Galaga Legions. If you've already exhaustively played Pac-Man CE and Galaga Legions, there may be little reason to get this collection other than the added 3D effects and portability. Otherwise, a solid addition to the 3DS library! Your top 5 (non-Square Enix) RPGs on Nintendo systems? Very nice review. I'm actually tempted to buy just from reading this review. All I need now is the money. Edit: I would have wished they had added Pac-Man DX CE though. That game is super awesome. Maybe we'll get a Pac-Man & Galaga Dimensions 2. Online leaderboards, for Pac-Man, yay! The rail shooter sounds cool, too. The upgrade system sounds pretty interesting, do your upgrades carry on from one mission to the next? Thanks. Yeah, I don't doubt for a second they had a follow-up game in mind when they chose the games for this collection. Yes, you carry over your upgrades to the next mission. If you die in a mission, you can re-try and will basically revert to the start of that mission with whatever upgrades you had at that point. Nice review, roy! Definitely getting this somewhere down the line. Sounds like the collection is worthwhile. Your review has nudged me towards buying it sooner than I had anticipated. Thanks! I was thinking about @Guillaume's enthusiasm for online leaderboards for Pac-Man CE, and I just want to clarify, since I only briefly mentioned this in the review, that there is only 1 level in that game that is ranked online, called "Championship: Ranked Mode." It has a 5 minute time limit. I have no idea how this compares to the XBLA version as I have never played it. @casper884 Glad to be of service. Cool! A game that I have not played. Well, a game with parts that I have not played. Oddly enough, I am most interested in the new games, since the trailer made them look pretty fun. 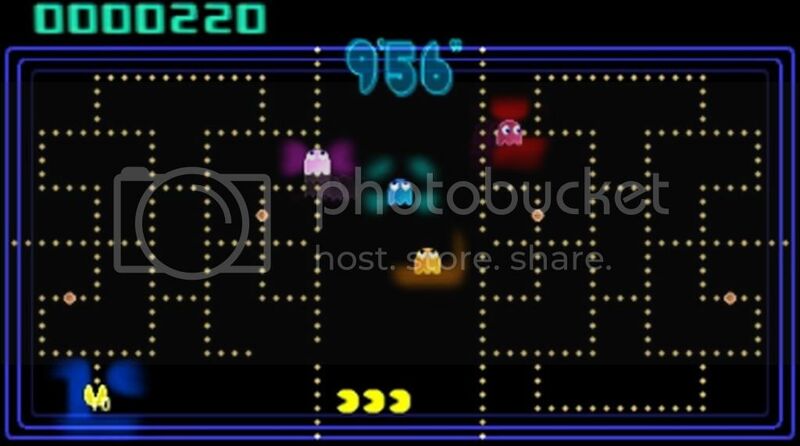 Too bad too hear about Pac-Man Tilt (the garish visuals kind of appeal to me, though - it looks like Vegas). But hearing about the 3D enhancements to the other games makes them sound more appealing. As soon as I see a great sale, I'll pick this game up. Odd that they didn't include Pac-Man CE DX with the package. 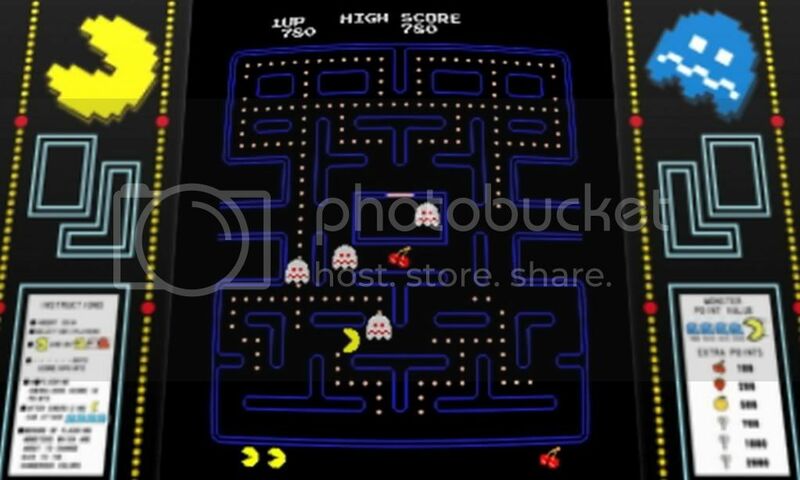 That's like the best Pac sequel since Ms. Pac-Man (1981). Huh - I thought I had already replied to this review. I guess not. In any case, this package is very intriguing to me. But really only for having Pac-Man Championship Edition for my on-the-go-gaming. I suppose I can't really justify spending $40 on that ONE game. I mean, I know I get the other 5 with it, but.... eeehhhhh. I'll wait for a price drop. The price is really the only thing that's keeping this game from getting in my collection. I was looking at this game today because I was given a $20 EB gift card and I wanted to spend it. I was SO CLOSE to picking this up. I got a Classic Controller Pro instead. Guess this will be another one I get down the line. Awesome review! Yeah, I guess the color scheme for Tilt is going for that over-the-top Vegas style, which in itself is not particularly bad, but it really clashes with the gameplay style. Well, except for the speed ball rolling levels, where it makes more sense. But it was done so much better in the Sonic casino levels! Maybe I'm just being unfair. I've only read about the numerous Pac-Man games like Super Pac-Man, Pac-Man Plus, Pac-mania, but I suppose Ms. Pac-Man really was one of the better spin-offs at the time. Whoa, so close! That's cool though, Classic Controller Pro is silky smooth, I love it. For everyone waiting for a price drop or a sale, let's keep an eye on our Video Game Deals thread (or the Canadian version)! It shouldn't be long before a new 3DS game sale pops up. Love the 3DS, but I gotta wait for the price to drop on some of these games. If you can find the game for this price (which shouldn't be too hard... most places sell it for $30, so finding it cheaper if you shop around should be doable) I definitely say go for it. Unless you've already had your fill of these games in other forms (particularly on XBLA) this is a great little package to add to your 3DS collection. Go for it! Ah! Nice score there dude. I'm a bit rusty on Pac-Man CE, so I didn't come close to the high score yet, but it will be fun just to pop it in every now and then and play! And hey, I haven't forgotten about Tatsunoko, I just haven't had a chance to set up an online match yet! ^ Cool. I look forward to any further high-score challenges. I still need to try and top your Pac-Man (original) score! And yeah anytime you're good to go with TvC just let me know. I'd still like to check this out at some point....though I'll have to retrain my hands to work with the 3DS' d-pad. I forget if I asked, but does Pac-Man run at 60fps? And all the ghost behavior is the same as in the original game? It's the same exact game as on XBLA? I'm no expert, but from what I can tell, yes. It's the exact same game as the one available on XBLA. Except portable. And in 3D. I'm no expert either, just like Grant. I will say that I never notice any hiccups in the framerate in Pac-Man CE. It's very smooth. And I haven't played the XBLA game, but every review I've read says the 3DS version is unchanged from the console version, other than it's scaled a bit to accommodate the 3DS resolution. And it's portable and in 3D. Alright, it took like, FOREVER, but it finally happened. I topped @Waluigi's score in the original Pac-Man. Alright Eric, I'm counting on you to top your (and my) score so I have another goal to shoot for! Nice job, Grant! I gotta get back into the game, and surely this will provide some motivation.